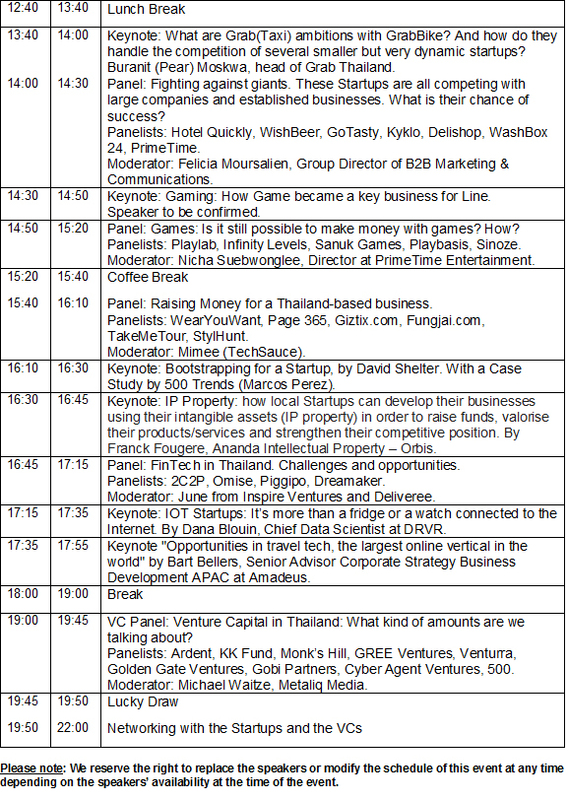 We bring you Thailand's best Startups on Stage! 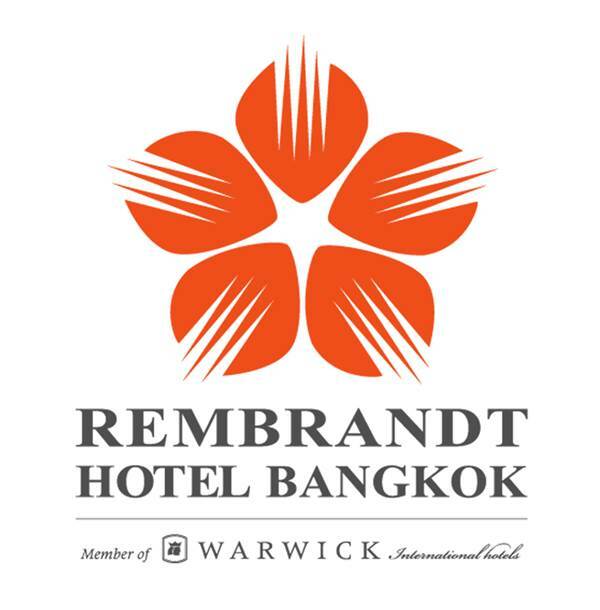 Join us at the Rembrandt Hotel Bangkok (Sukhumvit soi 18) on Wednesday 30 March 2016, from 8:00am, for a full day and evening of Keynotes and Panels from Thailand best Startups, VCs and Investors. Meet the Founders and Co-Founders, Learn about the best Startup ideas, Find out who has been funded and why, and Network with the Tech community. Visit the Startup Exhibition: New and existing Startups will showcase their Products and Services in the Exhibition Room (9:00am - 10:00pm). Enjoy our Netwoking Evening with one more keynote and up to 500 professionals from the industry, and some drinks and food. 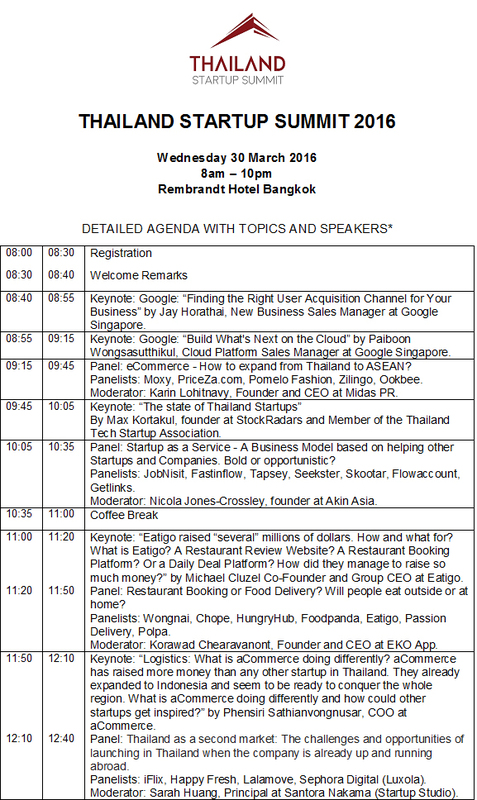 2C2P, 500 Trends, 500 TukTuks , aCommerce, AIS, Akin Asia, Amadeus, Ardent Capital, Blisby, Bookdose, Builk, Chilindo, Choppe, Coins.co.th, DealCha, DealSheep, Delishop, Deliveree, Dreamaker, DRVR, DTAC, Eatigo, Eko, Expara, Facebook, Fastinflow, FlowAccount, FoodPanda, Fungjai, Getlinks, Giztix, Gobi Partners, Golden Ventures, GolfDigg, GoTasty, Grabbike, HappyFresh, Healthbox, HotelQuickly, HungryHub, iFlix, Infinity Levels, Inspire Ventures, JobNisit, Kaidee, KK, Kiidu, Kyklo, Lalamove, Lazada, Line Games, Luxola, Metaliq Media, Midas, Monk's Hill, Moxy, Neibo, Omise, Ookbee, Page365, Parking Duck, PassionDelivery, Paysbuy, Piggipo, Playbasis, Playlab, Polpa, Pomelo Fashion, PriceZa, PrimeTime, ProMandate, Rushbike, Santora Nakama, Sanuk Games, Seeksters, SellSuki, Sendit, ShopSpot, Sinoze, Skootar, Stamp, StockRadars, Stylhunt, Taamkru, TakeMeTour, Thailand Tech Startup Association, Think Of Living, Tickets.co.th, TopDocs, TRUE, Venturra, Very Local Trip, WashBox24, WearYouWant, Wishbeer, Wongnai, Zilingo and more! Download the tentative agenda here! Please note: this is a tentative agenda. Speakers are not 100% confirmed yet. Some changes may happen and we will keep you posted. This ticket gives you access to the full-day conference (8am-6pm), the Tech Startup exhibition (8am-10pm) and the Networking night (7pm-10pm). It includes 2 Free Drinks in the Evening (after 7pm). This ticket gives you only access to the Tech Startup exhibition (after 6pm) and the Networking night, starting at 7pm. Includes 2 free drinks. This ticket provides 1 Startup booth in the exhibition room (we provide a table and 3 chairs, but not the decoration) and access to the event to 3 Startup members, from 8am to 10pm. This ticket provides 1 Investor booth in the exhibition room (we provide a table and 2 chairs, but not the decoration) and access to the event to 2 company members, from 8am to 10pm. We will only sell 300 tickets for the full event (100 Early Birds and 200 Regulars), and 200 more tickets for the Networking night only.